Back-to-school content is usually focused on teachers and students, and as these two groups will have the largest workload ahead of them, that makes sense. But for students, the ultimate support system is not an expert teacher, but an informed and supportive family. One of the most significant challenges facing formal education in the United States is the chasm separating schools and communities. 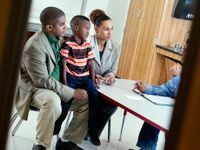 The more informed a family is, the more seamlessly they'll connect to so many other edu-constructs, from extracurricular activities and tutoring to reading programs and school-related events. "Ask them what they did today." "Help them with separation anxiety." "Talk to them about their struggles." But these kind of topical interactions aren't always enough, nor do they do anything at all to create transparency between schools and communities. So, in pursuit of that transparency, below are some questions to better clarify what's happening in the classroom, and then help you decide on the kind of non-superficial actions you can perform at home to truly support the learning of your child. Many of the questions may seem a bit direct, but I don't know any teachers who would take offense to them. In fact, most of my colleagues would welcome the kind of added capacity that questions like these could lead to. Many of these questions are rarely the subject of parent-teacher interactions, but -- well, that's kind of the point. Just don't ask them all at once. In fact, maybe pick two and hope for the best. And when you get interesting or surprising answers to these questions, please share them in the comments section below.